Fly fishing lost a legend on March 14. It also lost one its most amiable and effective spokesmen. In the decades after authoring his first book on tips and tricks for fly fishers, becoming the outdoors editor of the Baltimore Sun and the director of Miami’s Metropolitan Fishing Tournament, and beginning to teach his freewheeling style of extended-arm casting, Lefty Kreh became almost synonymous with fly fishing. He was author or co-author of at least 30 books, many of which were illustrated with selections from his voluminous photo library. Lefty leaves an enduring legacy as relentless documentarian and Explainer In Chief—a role he brought in person to hundreds of outdoors shows and clinics, beginning with a job as demonstration shooter for Remington Arms and most recently at an AFFTA/ICAST show in Florida, where he made a point to touch base with all those friends he had made in eight decades of fishing. Between those bookends, Lefty was an indefatigable teacher. His generosity and advice touched everyone from the sport’s experts to an uncountable number of people who would never have discovered the sport without such a dedicated ambassador. Perhaps a spinoff from his experience in guiding Joe Brooks, who became his early mentor and friend, Lefty was a self-described life-long learner and gave encouragement and advice to hundreds of up-and-coming writers, guides, casting instructors, gear designers and fly tiers. In 1991 the U.S. 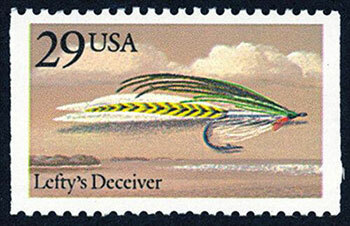 Postal Service honored Kreh’s “Lefty’s Deceiver” with a postage stamp. In 1985, when I was 25 and a novice Key West flats guide, I listened skeptically as Lefty confided: “Look, you have to be able to do a little bit of everything to make it in this sport.” Of course he was right. A dozen years later Lefty sent me a signed copy of his seminal book Saltwater Fly Fishing, which was the first authoritative guide on the subject. A hand-tied Deceiver (which he authored as a striped bass fly but which eventually became famous enough as an all-around fly pattern to land on a postage stamp) was taped beneath his signature. The note said: “To the best fishing guide in the Florida Keys.” I question the accuracy of Lefty’s praise, but there was no doubting the effect: it left me wanting to do better. 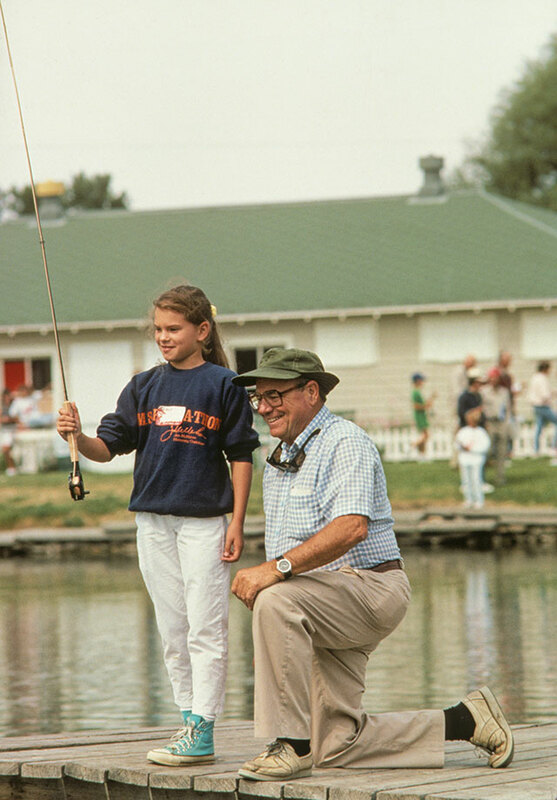 And that’s where Lefty’s legacy took root, whether he was recognizing the contribution of a twelve-year-old angler to the science of knot-tying or convincing a young wife that she could fish as well as her husband. Somehow Lefty could speak a few words, at the right moment, to someone who needed or deserved encouragement, and that person magically became a better, more enthusiastic fly fisher. There will and should be many remembrances of Lefty’s non-fishing accomplishments—as a young provider for his impoverished family, as forward artillery observer in the Battle of the Bulge, as an early voice in the struggle to protect rivers from dewatering and pollution. But when we talk about generational changes in fly fishing, and particularly about the irreplaceable and irrepressible personalities who helped ensure the emergence of fly fishing as a popular sport and expanded its influence, Lefty Kreh will be at the top of any list. He was, in a way, fly fishing’s moonshot pilot. He was the guy who showed up at the right place at the right time with the right combination of confidence and uncanny skill, but who never took his role for granted. Many of us benefited from his time on earth.